Founded in 1945, Bishop Leo Binz commissioned Fr. George Smith, pastor of St. Francis de Sales at Claremont to establish a new parish in Dodge Center on November 26, 1944. On December 12, 1944, the present site (with a large house on it) was purchased. 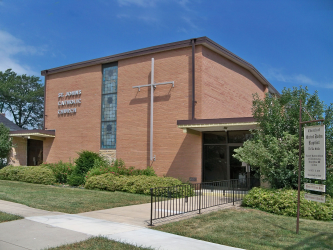 The lower rooms were remodeled for a chapel, and by February 15, 1945, the parish was incorporated as a religious corporation. The first Mass was by Fr. Smith on April 29, 1945. Thirty eight families were charter members of the parish. Bishop Binz suggested St. John Baptist de La Salle because there were Christian Brothers at Winona whose patron saint was St John Baptiste de la Salle. In 1950 a building committee was formed to study the possibilities of erecting a new church. By August 23 a basement was constructed with further plans for a church. The basement was completed in 1952. One way the parishioners made money was to sell their blood to the Mayo Clinic. Each person received about $25 for a pint of blood to be donated to the building. Plans were laid in 1956 to build from the basement up. Bids were let in July 1957 and construction began in November. A cornerstone was laid on May 13, 1958, and the church dedicated on October 26, 1958, the Feast of Christ the King. In 1959, the old rectory was sold and a new residence built on the north side of the church. In 1962, the garage was added. A remodeling of the church proper was undertaken in 1979 as an attempt to unify the entire liturgical working space in the current building area. Red oak was used throughout. Hand tooled copper was used for new Stations of the Cross. Rededication took place on September 16, 1979. In 1988, St. Francis in Claremont was clustered, and in 1990, St. Vincent in West Concord, to complete the Triton Parishes. The parish offices are in West Concord and the pastor resides in Dodge Center. In 2005, Fr. Kurt Farrell came to lead the flock. He was the first bi-lingual pastor. There is a Spanish Mass every Sunday. The year 2006-2007 saw the elevator being installed, making the church handicapped-accessible. New carpeting and new covering for the pews were done in 2008. St John’s Church is now over fifty years old, still going strong with over 120 families in our English-speaking community. On October 1st, 2016, St. John’s absorbed St. Vincent de Paul and St. Francis de Sales and became part of the Mary, Mother of Mercy Catholic Cluster as part of the Vision 2016 Pastoral Planning process.